As anybody involved in online anti hate activism knows from bitter experience, the backing of social media platforms (and Twitter in particular) is sadly lacking when it comes to tackling the racist, sexist, Islamophobic, Anti Semitic and downright offensive behaviours exhibited on the platform on a daily basis. Our group Resisting Hate have a policy of reporting the key offenders to Twitter. We frequently flag up tweets which include inflammatory content and we also report individuals who use the Twitter platform to abuse and bully others. In particular we target far right hate groups who use organised tactics to spread and publicise fascist views and images. Unfortunately our success in this area is very limited. Frequently Twitter reply to our reports with the explanation that the reported individuals are not breaking Terms of Service and are therefore within the permitted use of a Twitter account. 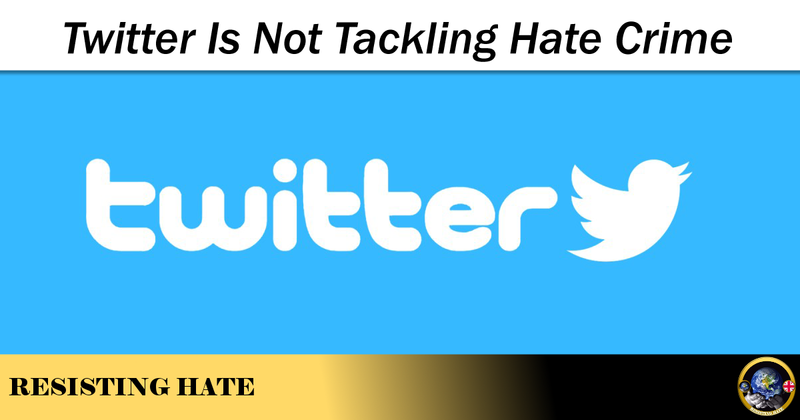 Some of the most extreme hate tweets we have reported in have been allowed to stay on the platform and the accounts have remained free to spread their hate. Our group is not the only anti hate group experiencing this problem. We frequently report abusive individuals to a wide range of more established anti hate groups and all, without exception, report back the same thing – Twitter is not taking the policing of far right hate content seriously. We believe that as owners of a social media site Twitter have a moral obligation not to allow their systems to be used to promote hate agendas. I am therefore taking this opportunity to illustrate some of the tweets that I can confirm for a fact have been reported by my group and others but which (currently) remain allowed by Twitter. If you agree with Resisting Hate that the following are unacceptable I would urge you to make your voice heard to Twitter and message them on @support or @twitter to tell them hate has no place on a progressive social media vehicle.